Making pickles, right, and Whalen’s products, left. Take a deep whiff. Or a nice big spoonful. There’s nothing like horseradish to tingle the palate and unclog the sinuses. Fans of the hot root love the crunchy, peppery condiment on their ham-and-rye sandwiches, with roast beef, on hot dogs or snuggled up to kielbasa. Horseradish puts the zip in their Bloody Mary and shrimp cocktail too. In our area, folks who need this fiery fix head to Whalen’s Root Cellar on Route 29 in Galway, near the Route 147 intersection. “It’s a best-kept secret. People come here and go to Waterwheel,” says Tim Bibens, owner of Whalen’s Horseradish Products. Waterwheel Village Country Store, known for its natural cheddar cheese, is less than two miles away. Bibens opened his kitchen/outlet store down the road four years ago after buying the business from his first cousin, Dan Bell, and Bell’s wife Stephanie. The Root Cellar is open year-round, and from now until Christmas, it’s open Wednesday through Sunday. 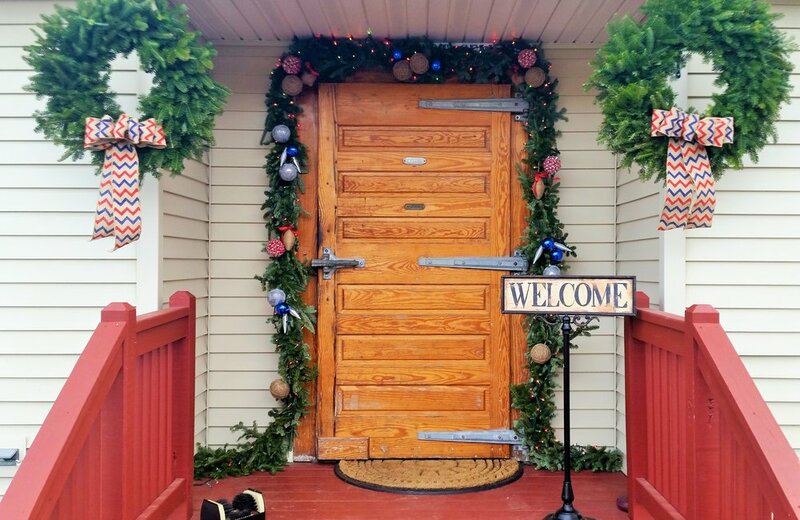 Visitors enter through a heavy oak cooler door that’s more than a 100 years old and was once in service at Finch Pruyn in Glens Falls and a store in Gloversville. In the store, one can choose from among 18 Whalen's products, from regular horseradish, beet horseradish and horseradish sauce to pickles, olives, mustard and eight kinds of cheese spreads. New this season is a Limited Edition Whalen’s Holiday Cheese Ball. All products are made from 15-inch-long horseradish roots that Bibens grinds and brines downstairs in his kitchen. “Not many people want to grind their own horseradish,” which is why it’s a specialized niche product, Bibens says. But Whalen’s is growing, with 45,000 units produced each year, and expansion through private label partnerships. More than 25 stores, delis, markets, meat stores and breweries in Capital Region, including Gabriel’s market in Scotia, Wm. H. Buckley Farm in Ballston Lake, Lakeside Farms in Ballson Lake and Predel’s Ranch in Rexford sell Whalen’s. During the holiday season, it’s available at Bob’s Trees in Galway. And you can order online at www.whalenshorseradish.com. Bibens eats some horseradish every day. A cruciferous cousin to cabbage, radishes and broccoli, horseradish has been used since Egyptian times as an aphrodisiac, a back rub, a stimulant and an asthma remedy. Around here, Whalen’s has deep roots, as the business started in 1925 by Frank Whalen of Ballston Spa, who delivered it by horse and wagon. A succession of owners unrelated to the Whalens kept it going until the Bells took over in 1997. 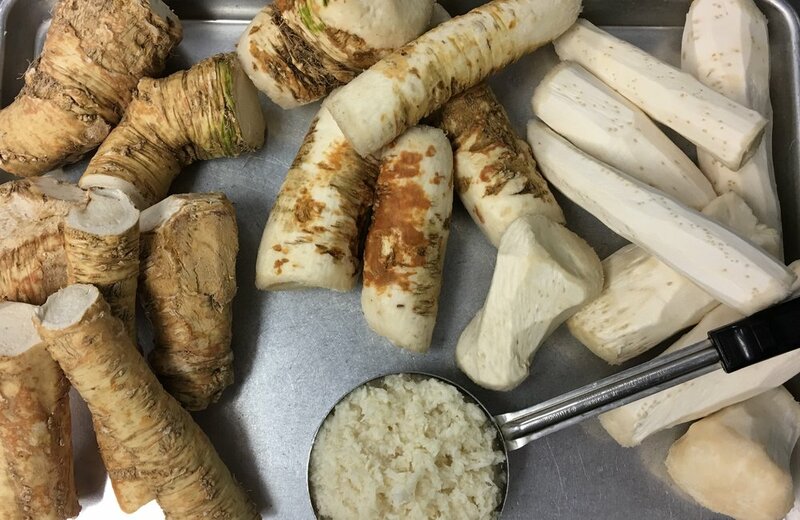 Today’s horseradish is made from roots grown in Collinsville, Illinois, in Mississippi River basin soil that’s rich in potash, an essential horseradish nutrient. Down in the kitchen, the roots are trimmed, chopped and peeled by hand then coarsely ground and brined without vinegar in big barrels. When Bibens transfers the ground root from the barrels, the fumes are so strong, he has to wear a gas mask and goggles. But Bibens, an electronics engineer with years of experience in industry, doesn’t mind.